Five applications of premium Fertilizer and Weed Control are applied at optimal times and soil temperatures throughout the season. Fertilizer applications provide the correct amounts of nutrients. The fertilizer is applied in granular or liquid form to stimulate leaf growth, promote green color, and develop root systems. 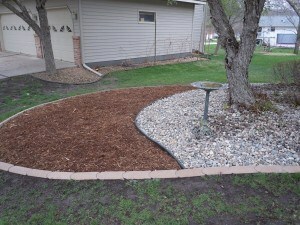 Lawn fertilization & weed control is sometimes called “weed and feed”. Our licensed technicians use the safest methods to protect your property, family, pets and the environment. The result is a healthy, beautiful lawn, which resists harmful diseases and insects. We provide five fertilizer treatments throughout the growing season. These treatments supply all the necessary nutrients at the appropriate times needed to maintain a healthy and vigorous turf . This service also includes three treatments of weed control. These treatments will control annual grassy weeds as well as all broadleaf weeds. 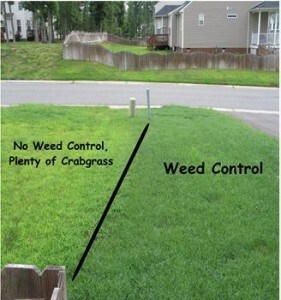 What does proper lawn care fertilizing and weed control mean to you? Thicker, greener turf, fewer weeds, a healthier more attractive lawn and a heartier more stress-resistant lawn. Granular Pre-Emergent is applied in landscape beds in early spring before weed seedlings emerge. This granular application is effective at stopping weed seed germination thereby reducing weeds throughout the season. Weeds already growing will not be effected, therefore will need to be treated with a non-selective herbicide such as Round-Up. Although this application is recommended in the spring it can be done at any time throughout the season. This application will pay for itself in little time because all the time spent pulling weeds in your landscape beds is eliminated.